Ok, so we’re not really the type of folks to throw out the greenwashing penalty flag, but this is just ridiculous. 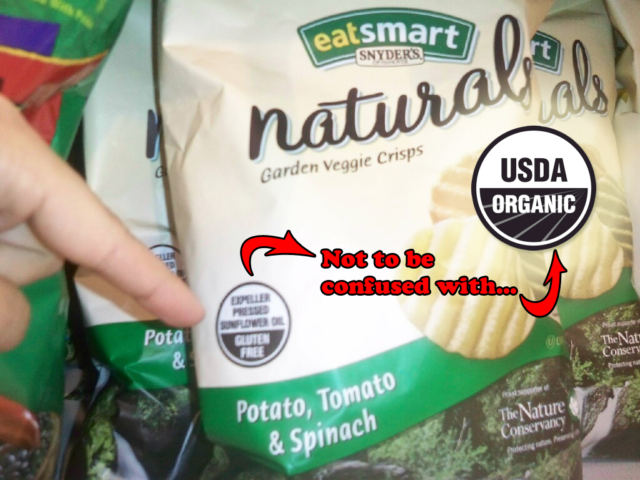 Snyder’s of Hanover has ripped off the design of the USDA Organic seal to simply list product ingredients… and ingredients that aren’t even organic. I posted it on The Fun Times Guide to Living Green’s Facebook Page earlier today and our awesome friends there were as shocked as I was. We’ll never label a business or person as a greenwasher for making a little more of their efforts then are actually warranted, but to do what seems like a blatant attempt to bamboozle well-intentioned customers who are trying to eat healthier and organically? Come on Snyder’s, that’s just messed up. What do you think? Feel free to weigh in here or on the Facebook Page link above. I might give Snyder’s a bit of a break if these “Veggie Crisps” really were organic, but do you see the word “organic” listed anywhere in those ingredients? Yeah, me neither.